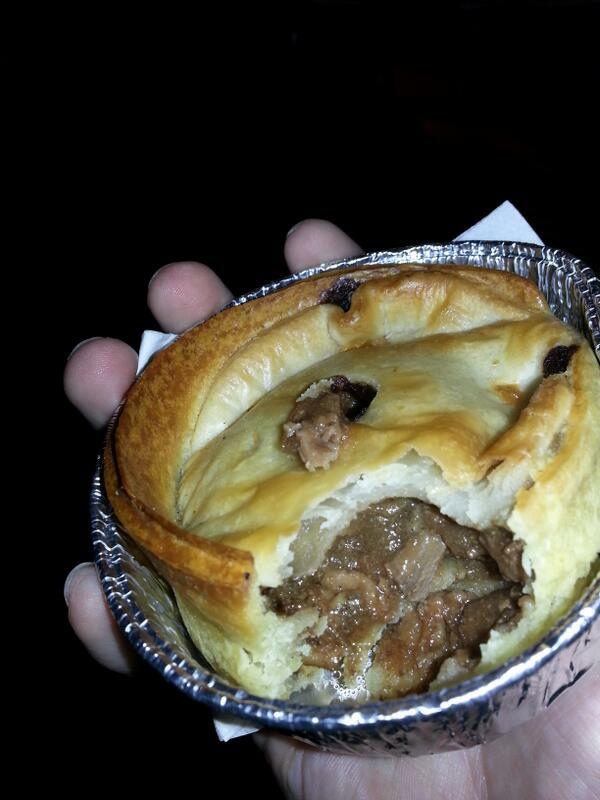 As promised here comes Pie #2 from Friday night’s adventure to Hampden. This pie is the first one to be reviewed that will be dubbed as a ‘Luxury Pie’. Now to be a luxury pie the criteria is very simple, you just have to not be a scotch pie. That’s it. You can be steak, chicken, mongoose and lingonberry, whatever you like as long as your not a basic scotch mince pie. The reason for this you ask? Well I go to many games of football, and many places more than once, some of these places offer more than one type of pie. Sometimes I’ll do two in one go like I have at Hampden, others I may review on separate occasions. Either way it’s good news because it will mean more pies to taste, and that’s why we’re all here because we love a good pie. Before we start it is also important to note that unlike a scotch pie, with ‘luxury pies’ you do not use brown sauce, the filling should suffice, that’s why you pay extra, only when something has gone wrong should the ‘Pie Band Aid’ be applied. That’s the rules of luxury so, Let’s Rate Some Pie! Price: At £2.60 this is 40p more expensive that it’s scotch equivalent but, as previously stated, is seen as a more high end product, something I will confirm one way or another in the next few paragraphs. Presentation: Well that extra 40p doesn’t change how the pie gets handed to you, silver tinfoil case and a tiny, tiny napkin. However in this instance the case and napkin combo cause a couple of issues not encountered when consuming a scotch pie which will be covered further down. Meatiness: Now this is not mutton, this is prime steak in an unctuous savoury gravy, well at least that’s the idea. I’m pleased to say that this was a perfectly acceptable attempt at it, the pie had clearly been baked for the appropriate amount of time as the gravy had not dried out and the meat was still pull-apart-at-your-teeth tender. There was a distinct taste of steak, although for me I would like a bit more pepper, but that’s personal preference as I like a bit of spice. Pastry: Being a ‘luxury pie’ you are treated to a puff pastry top, which in this instance was sufficiently risen to be called puff pastry but not so much that the pastry to meat ratio was effected. However when picking up the pie the bottom completely fell out of it due in part to the plentifulness of the gravy. This is a common gripe I have with steak pies as it often results in you spending more time getting yourself in a right mess than focusing on the game in front of your eyes. Covering your fingers in gravy and steak rather than using the pie casing to do the work for you. This is why the reason the picture above is still sitting in the case. That being said the pastry complemented the filling very well and compared with some I have had in the past this crust was still relatively sturdy barring the very centre. Overall: A first venture into luxury pies and it can be deemed a moderate success, tasty filling and nice pastry but while the bottom falling out doesn’t impact on flavour it does mean you get in a bit of a mess. You might even enjoy that. However I think its fair to say that in these circumstances a napkin the size of Papa Smurf’s bed sheets doesn’t really suffice. Gravy Factor: Tasty Gravy. A good marker for all luxury pie’s to aspire to, need to sort that soggy bottom though. Did you know you can Subscribe to Pie? Simply click on the ‘Follow’ link on the right and you will get an email advising of the glorious news that a new pie blog is ready for your consumption and while your at it why not have a look at ‘Leading The Line’ a blog not based solely on Pies, crazy I know! The link is on the left hand side and with all things going to plan will have a new article up tomorrow. One last thing before I go, whilst in ‘The International’ after the game, I came across this gem of a poster. 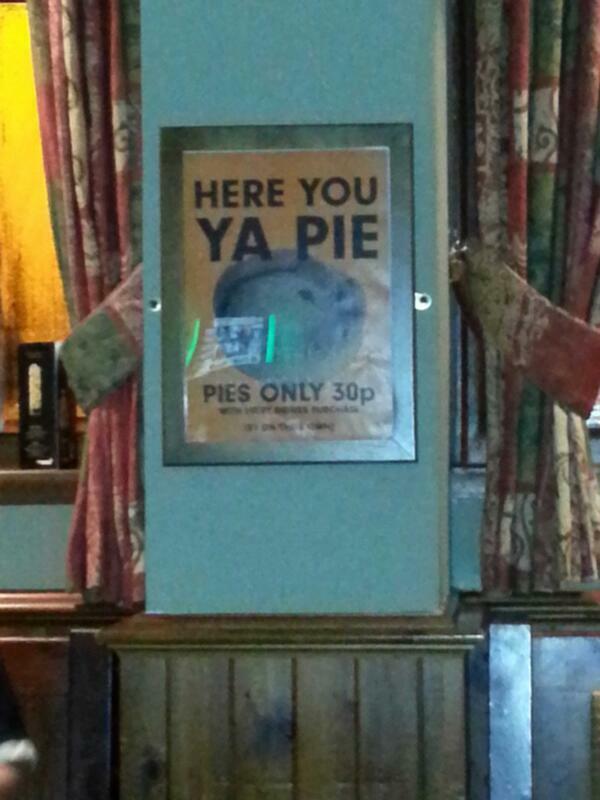 A pie for 30p when you buy a pint. Bargain! This entry was posted in Football Pies, Luxury Pies, Professional Pies, Sporting Pies, The Life of Pie and tagged belgium, brazil 2014, brown sauce, Gravy, hampden, international, Meat, pastry, Pie, rain, scotland, steak, tartan army, world cup.